The internationally bestselling authors of The Sandman and The Hypnotist return with a terrifying new thriller: Detective Joona Linna–recently returned from compassionate leave–reunites with hypnotist Erik Maria Bark in a search for a seemingly unassailable sadistic killer. The Swedish National Crime Unit receives a video of a young woman in her home, clearly unaware that she’s being watched. Soon after the tape is received, the woman’s body is found horrifically mutilated. With the arrival of the next, similar video, the police understand that the killer is toying with them, warning of a new victim, knowing there’s nothing they can do. Detective Margot Silverman is put in charge of the investigation, and soon asks Detective Joona Linna for help. Linna, in turn, recruits Erik Maria Bark, the hypnotist and expert in trauma, with whom Linna’s worked before. Bark is leery of forcing people to give up their secrets. But this time, Bark is the one hiding things. Years before, he had put a man away for an eerily similar crime, and now he’s beginning to think that an innocent man may be behind bars–and a serial killer still on the loose. 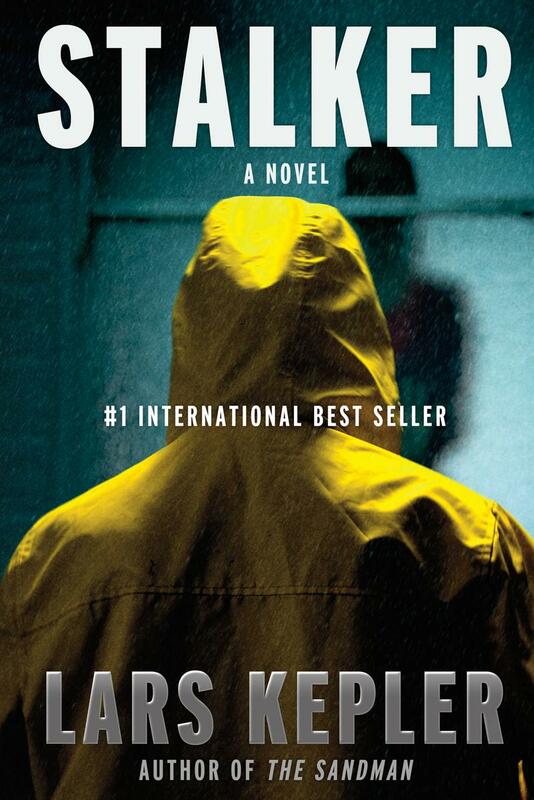 . .
A serial killer stalks and videos their victims, taunting police before the murder takes place in the latest Joona Linna novel, STALKER. Swedish couple Lars Kepler delivers another extraordinary whodunit, amping up tension and suspense in this terrifying serial killer thriller. The book opens with the Swedish National Crime Unit receiving a video of a young woman in her home, moments before she is brutally killed. And then another video comes… and another. Detective Margot Silverman is leading the investigation, but getting nowhere. Thankfully, Joona Linna is back, his path once again crossing with hypnotist and trauma specialist Erik Maria Bark, and together the three of them search for the sadistic and elusive murderer. But in order to find the stalker, Erik is forced to revisit an old case, dredging up secrets he’d hoped would stay buried, be forgotten with the passing of the years. The latest murders bear a striking resemblance to a one from long ago… committed by a man he helped convict. More videos come in, more brutalized women are found, leading Joona, Margot and Erik down a dark and seedy path, to Stockholm’s underground world of drugs and prostitution. Probing into the lives of fallen priests, and those who both battle and succumb to addiction, we learn how far some are willing to go to feed their compulsions and obsessions. You won’t believe what happens by the flip of the final page. STALKER is an absolutely stellar thriller, with faster pacing as compared to some of the other slower burning installments in the series. Joona Linna is ever the fascinating, flawed hero. He’s physically weak, crippled by migraines, but in deep vigilante mode—brazenly doing what must be done, consequences be damned. But once again, it’s his acuity and doggedness that leads them to unmask the serial killer—a gasp-inducing gut punch that’s utterly brilliant. Viscerally unflinching and unrelentingly tense, this serial killer thriller will leave you breathless and clamoring for more. Would you recommend following the reading order?